Goal Flow helps to determine the path that the visitors follow while reaching the end of the node i.e. the conversion. It is extremely important for online shopping websites to track down the exact number of sales that are generated through visitors entering the website. It is useful for the business to know the exact path followed by the visitor in making a successful conversion happen. 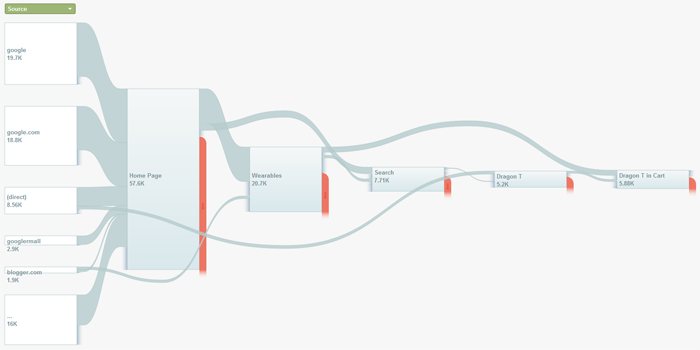 Google Analytics helps a webmaster to visualize the exact path from entering the funnel to reaching a goal. The Goal Flow also indicates where the visitors are dropping off from the Goal Flow chart. The above figure illustrates the example of a Goal Flow where visitors enter the funnel through different traffic sources like Google, direct traffic, blogger etc. and reach the home page. After reaching the home page, the visitors starts to navigate to different pages of the website and the "Red Points" indicate the "drop outs". Ultimately a certain percentage of visitors reach the cart page to purchase products. With the help of Goal Flow chart, webmasters can find out those specific points (marked by red) where the traffic drops out and can optimize these in order to improve the sales flow of their business. Have a look at this video to understand more about Goal Flow in Google Analytics.